Last week I visited a very special cafe in Bangkok that had long been on my bucket list. It is a place of wonder and imagination. An eruption of pastels and splatters of rainbows. 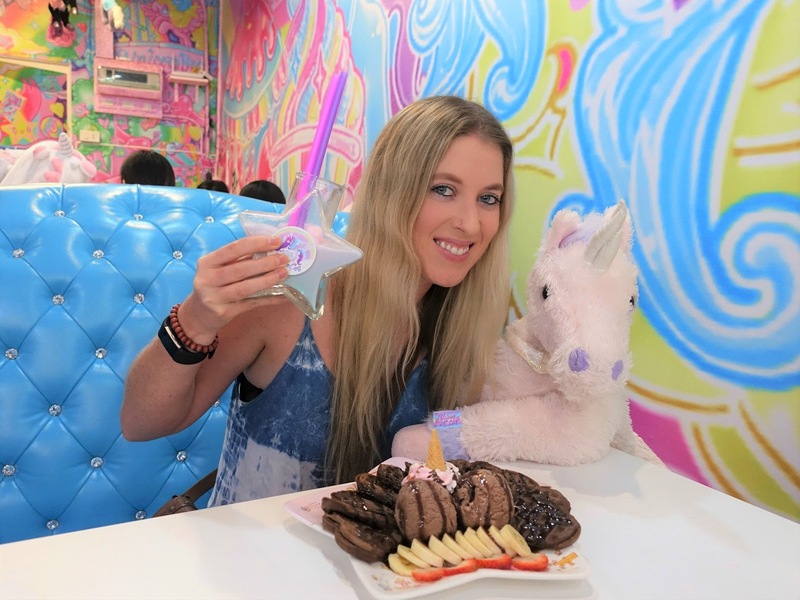 It is a place like no other… it is The Unicorn Café. If you used to like My Little Pony and are still a twelve-year-old trapped inside an adult’s body (like me) then you will adore this cafe. Located in Silom, it is a fairly small cafe with a whole lot of fun packed inside. As soon as you step into this magical wonderland your eyes will instantly be feasted to a colourful explosion from top to bottom. The walls and ceiling are decked out with unicorns and ponies splashed in every direction. There are plenty of cute pastel coloured tables, chairs and sofas to hang out on and enjoy the large selection of rainbow themed food on the menu. Line up at the counter to order before heading to a seat with your number. 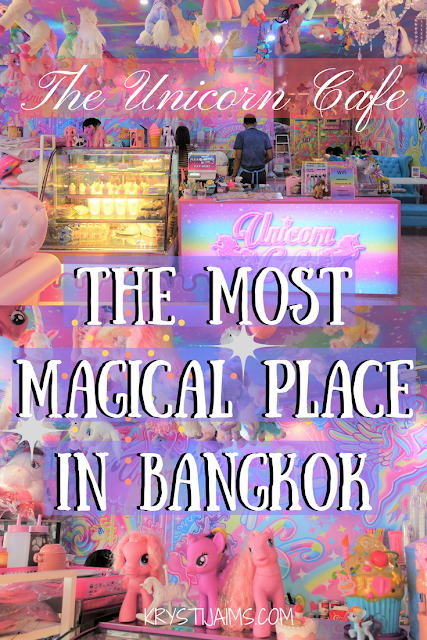 There is a section to the left with pony and unicorn dolls and soft toys to grab and hang out with and you can even rent unicorn onesies for 100 BHT ($3 USD). The amusing menu offers a selection of savoury as well as sweet options. From rainbow spaghetti carbonara and a rainbow cheeseburger (which admittedly looks rather disgusting yet entirely intriguing) to unicorn waffles, crepes and brownies. The front cabinet is also full of their signature Instagram-perfect rainbow layered cake and cupcakes. There are fun frozen ombre galaxy drinks on offer too which come in star shaped glasses. I ordered a ‘Galaxy Star’ which was a frozen vanilla frappe and the ‘Unicorn Waffle Choco Banana’, which came complete on a cute plate with star utensils. Both were delicious and a very reasonable price at 340 BHT for both ($10 USD) and the portions were enormous! I definitely should have shared as I struggled to eat half of it. It was a wholly lighthearted experience enjoying the surroundings and sitting amongst like-minded giggling and snap-happy girls (and yes we were all adults). I felt like it was my birthday having chocolate waffles and ice cream for lunch! The Unicorn Café has become my new favourite place in Bangkok (hence why I had to write about it!) and if you are passing through it is a must-visit for those wanting to go back to those magical feelings of childlike wonder and euphoria. I wanted to go back the very next day. I would definitely hire a unicorn onesie next time and get a slice of that rainbow cake! Warning: Sugar high and a massive afternoon crash is inevitable but entirely worth it. It’s a whole lot of fun and you will leave with a bright smile on your face (accompanied with a possible stomach ache). Also warning: No, this isn’t really a place guys will enjoy unless you are one of the few cool pony-loving ones out there. The Unicorn Café is located at: 44/1 ซอย สาทร 8 สีลม Khwaeng Silom, Khet Bang Rak. The closest BTS (Bangkok Sky Train) is Chong-Nonsi Station, Exit 2. They are open every day except Mondays from 12 – 8 PM.